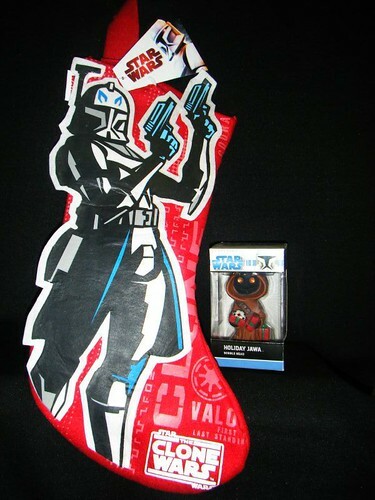 Our first Pre-Christmas Giveaway is a Clone Wars Clone Trooper stocking and a Holiday Jawa bobblehead. What planet in the Star Wars Universe would you live? I would choose Tatooine because i love warm weather. Tatooine for sure!! I hate Cold weather planets and Tatooine is exactly the oppisite. Plus riding Pod Racers all day would be nice. Felucia looks pretty neat. Although I'm not sure I'd want to step on a gelagrub while I'm barefoot taking out the trash. I hate the heat ... it's already getting stinking hot here today, and it's not even really summer yet! Late February through to about March are horribly humid and sticky here! Note: I'm not actually entering the competition, but just had to reply to that one. Hoth. because i love the cold and wampa's! I would choose Kamino. I love the rain! Man! I'd glady swap countries with ya! Here it's super cold and there's ice & frost on everything when I go outside. Snow should be falling in a couple weeks. I would live on Rori. It is close enough to Naboo but also not as built up with some rustic qualities.